This actually has nothing to do with cats at all. Go figure, the cat is really away. The idea of animal personification for stories is something that has happened for probably as long as we have been telling stories. You know, it’s one of those things we do to try and make sense of the world we live in. And then when we look at this trend of people people treating their pets as human family members (sure sure it’s always been done but it is to a strange level of crazy cat lady now compared to how it has been in the past). We like to give animals a sense of human society. Even though this is far from what nature tells us. Ok so what the heck am I driving at here? Sorry, let me back up a little bit. 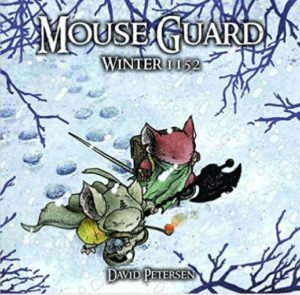 I ran across the graphic novel Mouse Guard: Winter 1152, not too long ago. Let me tell you, this one blew me away. The gist of the story is a harsh winter for a community of mice in the Middle Ages. Their society is very much like what you might have expected a bit of human society to be like in that time period, at least as far as those who happened to live in a castle instead of those out working the land. This is actually the second book in the series, the first covering the fall of 1152 (still need to get my hands on that one). Now that I have brought this one up, I want to bring up another story series that I feel runs quite well next to this one. Redwall also deals with a community of mice that have been personified. In these stories it is the mice who live at the monastery of Redwall and the world they inhabit. Now keep in mind the personification factor and how the characters in these stories fulfill human roles. In these stories we see true fantasy and many times the use of the heroes journey as the template for how the story progresses (if you don’t know it, look it up.) The use of that set structure leaves room for so much more to happen while the story progresses. What I am saying here is, the stories come out in a way that children can follow their pattern, while at the same time they give so much more for advanced readers to take something away from them. This is where I tie the two story lines together as well. It is something more than just the stories of mice in a historical period. I mean sure that is an in your face observation of them. But there is something more, maybe on a more subtle level. In each story only certain animals are given human mannerisms and life structures. In Redwall (the story of Mathias) they have a feast from a fish caught in the lake near the monastery. No thought is given to the life of the fish, it is simply food, while so many other creatures are given thoughts and feelings, the fish is there simply to feed those who can catch it. In the Winter of 1152 story there is an epic battle between two of the mice and an owl. The thing to note here is the owl is simply looking for food. The mice are fighting to defend themselves. It is in their battle against a natural predator that we see a difference between the levels of personification. The mice are given a chance at glory, a new tale to tell if they survive the battle. The owl will simply live another day. It is stated as a sign of emotional intelligence when we are able to empathize with others around us and understand the pain they are feeling. But too often we find ourselves like the mice. We don’t always see anything but those like us and how we view the world. And just like the mice we push our view of the world onto others accepting that they must see it the same way we do. Too often we are shocked and maybe a little disappointed when we find that they view it differently than we do. Which brings us back to another example in the story. Within Mouse Guard, they used rabbits much like horses. Their assumption was that the rabbits were happy to take them from place to place and even into battle. They hadn’t realized that the rabbits had their own thoughts and feelings. Sure the story didn’t delve deeper into the situation and the resolution happened fairly quick in that the mice decided to make reparations and increase the rabbits stores of food and such. But the idea remains. Not everything is what we assume it to be. I dare say that either Redwall (by Brian Jaques) or Mouse Guard are well worth some of your time. 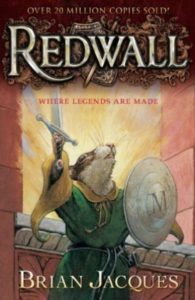 I’m not sure if Redwall has been made into graphic novels yet but you can find the cartoons that came from the series on YouTube. No matter which format you find them in, the stories will give you something to remember. 2 Responses to "While the Cat’s away"
Sometimes it is easier to see things we miss through the different perspective.